We've just got our new class schedule up on the site. All our sewing classes take place in our shop at Burwash Manor just outside Cambridge. Take a look - there are lots of old favourites like 'Start Dressmaking' and 'Smocking' but there are some great new classes like 'Shirt & Blouse Technique', 'Zip Technique', 'Make a... Pair of Pyjama Bottoms' and 'Make a... Vintage Apron'. We've tried to bring the costs of these classes down this season too - so check out our new lower prices! 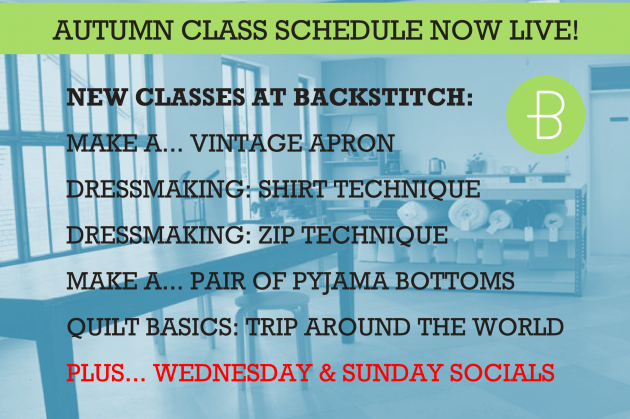 Due to demand we have brought in a new session: the 'Social Sew'. Come and work on your latest project in our fab bright studio space. Get away from the housework and treat yourself to an uninterrupted day of sewing. Just £3.50 per day - Every 1st and 3rd Wednesday and Sunday of the month. Machine Basics: Tote Bag: Learn how to thread a machine, change a needle and change your stitch and speed settings. Get some practice sewing with different stitches, and starting and stopping. Leave the class having made a fully lined, boxy tote bag. Machine Basics: Cushion Cover: Learn how to thread a machine, change a needle and change your stitch and speed settings. Get some practise sewing with different stitches, and starting and stopping. Leave the class having made a button back oxford cushion cover. Make a... Zip Pouch: Make a lined zip pouch. This is a great class for combating your fear of zips and making something fab and useful at the same time! Introduction to Machine Embroidery: Enjoy the freedom of Free Machine Embroidery! This exciting technique will bring an added dimension to your projects, helping to create unique pieces of work. In this class you will learn how to set up the sewing machine; manoeuvre your hoop; 'draw’ and ‘paint’ with the sewing machine to produce a simple 'doodle' sampler. If you like, you can come with an idea of some of the shapes you want to try and recreate sketched out. You may wish to attend multiple classes to develop your design ideas and techniques. Introduction to Machine Applique: Free motion applique is a modern technique that is really gaining in popularity at the moment. It is a great way to use your sewing machine creatively. It is not difficult, you don’t even need to be ‘artistic’ to get some great results! In this class you will be taken through the process to create your own appliquéd picture, including sources of inspiration and choosing fabrics, as well as how to use your machine to create a fabulous, unique picture. Introduction to Smocking: Smocking is an easy to learn, yet impressive, traditional English hand sewing technique. It produces an attractive and hardwearing effect suitable for use wherever fabric is gathered. It is fabulous on bags, cushions and garments. It works particularly well on pockets, sleeves and under yolks. In this class you will learn to smock with up to 5 different decorative stitches (depending on your speed of stitching) that can be combined in different ways. You will leave the class with a smocking sampler that you can use to remind you of the techniques you have learned. Introduction to Cross Stitch: This class will get you started on this simple and satisfying craft. Learn about fabric and stitches, how to read a pattern, begin and end your threads, and get started on a small project of your choice. Embroidery Basics: Line Stitches: The first class in our Embroidery Basics series this covers ten different line stitches: back stitch, threaded back stitch, stem stitch, running stitch, coral stitch, zig zag stitch, whipped running stitch, whipped stem stitch, pekinese stitch, chevron stitch. Students will leave the class with a sampler that is a work of art in itself as well as a great reference tool. Embroidery Basics: Chain Stitches: The second class in our Embroidery Basics series this class covers eight different chain stitches: chain stitch, double chain stitch, raised chain band, zig zag chain, whipped chain, daisy stitch, chequered chain, twisted chain. Students will leave the class with a sampler that is a work of art in itself as well as a great reference tool. Embroidery Basics: Looped Stitches: The third class in our Embroidery Basics series this class covers a number of different looped stitches. Students will leave the class with a sampler that is a work of art in itself as well as a great reference tool. Embroidery Basics: Knotted Stitches: The fourth class in our Embroidery Basics series this class covers eight different knotted stitches: french knot, bullion knot, double knot, Portuguese knotted stem stitch, braid stitch, scroll stitch, knot stitch and Spanish knotted feather stitch. Students will leave the class with a sampler that is a work of art in itself as well as a great reference tool. Dressmaking Technique: Shirts & Blouses: An excellent follow on class from ‘Start Dressmaking’ this session focuses on some of the common techniques associated with making blouses and shirts. Gain theoretical knowledge and practical experience in: Setting in a sleeve; Creating a cuff; Creating a collar. Dressmaking Technique: Zips: An excellent follow on class from ‘Start Dressmaking’ this session focuses on the thorny subject of zips. Gain theoretical knowledge and practical experience in: inserting an invisible zip; Creating a lapped zip; Creating a fly front. Make a... Sailor Top: Over the course of the day you will learn how to read the sewing pattern, cut out your pieces and construct the Fancy Tiger Sailor Top. You will leave the course with a fully made garment. Make a... Pair of Pyjama Bottoms: A great place to start with making clothes! Measure up and make yourself a simple pair of pyjama bottoms. Make a... Vintage Apron: Make a fun vintage style half apron complete with frill and pocket. A great way to increase your sewing confidence and make a fun item for your kitchen! Quilt Basics: Trip Around The World: Get started quilting! This class is a great introduction to cutting and piecing your first quilt top. We will be teaching a very basic quilting block called the 'trip around the world’. Students will be talked through the construction of the block, and will be able to cut and sew a couple up. Guidance will be given to then replicate this block at home to create a quilt top of approximately 48" square. Quilt Basics: Quilt & Bind: Pot Holder: With this great intro to finishing your quilt you will learn the principles of creating your quilt sandwich, quilting using a walking foot and (non-bias) binding. You will leave the class with a insulated pot holder/ table mat and the knowledge to scale up and finish your own quilt. 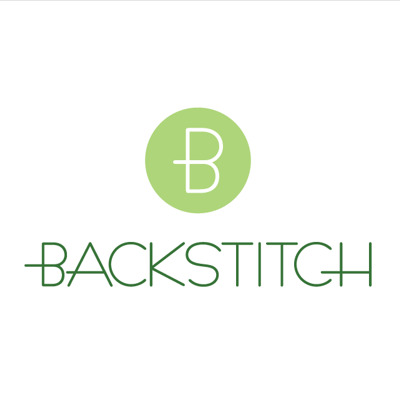 Backstitch Social Sews: Now we have such a spacious studio space we are opening it up to you for tutor-less sewing sessions. Bring your machine, latest project, a friend, and perhaps some cake and you can take advantage of our large and well equipped studio. Enjoy being away from the distractions of home, use our massive cutting table, and help yourself to tea and coffee. Sewing machine hire also available in this session. pj bottoms please - when / how much?